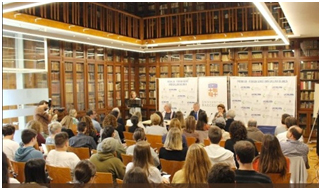 In order to promote the studies of Human Nutrition and Dietetics, and Food Science and Technology, and to favor the elaboration of research works that relate the different sciences with the daily realities, the University of Barcelona, within the framework of the objectives of the Food Campus of Torribera, announces a prize for research work in high school on this subject. Ferran Adrià, doctor honoris causa by the University of Barcelona, has accepted that the Prize bears his name, and the Gallina Blanca company collaborates in its promotion. Four prizes are awarded: the best work related to gastronomy, Sent Soví Award for the best work related to food (nutrition, agriculture or food technology), Food Safety Award for the best work related to food safety, Prize for the most involved and proactive school, institute or center. Both the University of Barcelona and Gallina Blanca are members of the Triptolemos Foundation.